Perth Pest Control Starting at $280 to Leave you Pest-Free for 12 Months! wrench Get A Free Quote! Are you looking to ensure that both your home and business are free from unwanted pests? We handle both domestic and commercial pest control. Lets face it, any pest in your home is unwanted, let us help you get rid of them safely and easily with our proven pest control methods. We treat a wide variety of domestic and commercial pest control issues, everything from ants to mice. If your home or office has been invaded by unwanted pests, we can take care of it for you, guaranteed! Not only do we provide the best domestic and commercial pest control in the area, but we offer our services at highly competitive and affordable rates. We understand that pests in your home or office are a major burden and can potentially cause many issues for your home or office so we aim to get rid of those pests for you without causing additional financial stress to an already stressful situation. We guarantee that you will be satisfied with our domestic and commercial pest control service or your money back. We never compromise the quality of our pest control methods and use only the safest, most efficient methods to effectively get the job done. If you are looking for domestic and commercial pest control, don't wait, call us today! Termipest provides Perth residents with a premium pest control service that will leave your home clean and safe from infestation, now and in the future. With the best service at the best prices, you can rest assured that the team at Termipest is the number-one choice for ridding your home of those nasty bugs and rodents that can cause health problems for your family and irreparable structural damage to you home. Trust your pest control Perth to Termipest. Feel free to contact the friendly team at Termipest to have your home under control and free of any nasties invading your space. Our products won't stain or smell. We will treat anywhere you want. Children and pets can remain indoors during the treatment. After checking the roof, we use a non-toxic dust that treats silverfish, crickets and spiders for up to 12 months. We bait the roof for rats if necessary. We spray Bifenthrin which is registered for termites. Plants and the surrounding environment won't be harmed. We spray for pests everywhere. Looking for the best prices in Perth? Thanks to our extensive experience within the industry, our professionals are backed by the right qualification and skills to ensure each job is done efficiently, effectively and at the best price possible. By tailoring an independent quote to suit your specific needs, we'll attend to the job with enthusiasm, attention to detail and respect. Not sure where to start? We encourage you to give our pest control team a call on 1300 66 2847 or send us a message via our contact page. We can provide you with a quote and answer any questions or advice in regards to your individual situation. Would you like to ensure your home or business is free from unwanted pests? Here at Termipest, we offer both domestic and commercial pest control in Perth that treats a wide range of common pests that invade Australian properties. As well as offering effective treatments that ensure a pest-free property for at least 12 months, we pride ourselves on our competitive pricing that will fit within your budget. We guarantee that you will be satisfied with the service provided by Termipest: we never compromise on the quality of our pest control treatment, and we use only the most hygienic, state-of-the-art chemicals and equipment to treat the problem. Chances are, if there is any kind of unwanted pest in your home or office, we can provide a safe and effective solution to not only getting rid of them, but also ensuring that they do not come back. When you give us a call to handle your domestic and commercial pest control issues, we take the time to do a thorough investigation of your entire home or office space. We often come to your home or office for one issue and discover that there is much more happening than meets the eye. We take care of everything for you so you and your home or office are no longer at risk for pest related damages or illness. Our highly trained pest control specialists know and understand the common patterns of domestic and commercial pests and can therefore stop the pests life cycle to prevent future infestations. 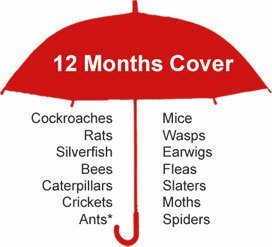 Pest control is not a one-time deal-it needs to be handled on a year-round basis. We don't just come in once and then wait for you to call us back with another pest control issue, we continue our care and monitoring of your home to prevent any future invaders and to keep you and your family safe. If you are in need of domestic and commercial pest control services, look no further! We handle all of your pest control needs from top to bottom. With highly skilled pest removal specialists and award winning customer service, choosing us for your pest control needs for your home or office is a no brainer. Give us a call today and let us show you why we are the best domestic and commercial pest control service around. While many property owners will try and treat the problem themselves with store bought treatments, this is not enough for a serious infestation. Whether you fail to eradicate all of the pests in the beginning, or clear the property only to discover an infestation again a short time later, we can tackle the issue in an efficient and professional manner. If you require an effective, long term solution, we are here to help. As well as the nuisance pests can cause for property owners, there is also the health and safety concerns an infested property can create. Pests are famous for spreading germs and can pose extra health concerns if they sting or bite. For businesses, there is also potential damage to their reputation if clients discover a pest problem. If you would like to ensure a clean and safe environment for your family or workers, contact us today to request a quote for commercial or domestic pest control. Need Pest Control Services for Perth, Western Australia? Offering Pest Control Services for Perth, Western Australia, and surrounding areas. Do you have rats, ants, termites, cockroach or other unwanted critters lurking? We are a professional pest control service company that can come out and take a look. We know Western Australia and all their pests and how they live. It is important to understand the pest that you need to get rid of, the food they like or the sleeping habits help us get the pest out in a safe manner for the people and pets of the home or business. We offer Residential Pest Control as well as Business Pest Control services for all of Perth, WA. Do you have a pest problem and need some help? Not sure even what that noise is in the walls but you know the walls don't make that noise on their own? We can come and check it out. We live in your community and understand the ways of life in Perth, WA. We know what pests are here and at what times of the year they are more problematic than others. We work with our clients to get the best results in the best fashion for a variety of pests. Some pests we use sprays, while others we trap and some need a combination of both. We do all of this in a fashion that will protect the non-pest animals and people around. Our dedicated team will carefully evaluate your pest situation, as every situation is different to come up with the right plan for you. We are an environmentally friendly company that looks after your safety and health first and offers support to the entire community. Our staff have worked in this industry for a long time and understand the importance of the safety standards. Offering superior results to all of our clients with our top-notch pest control and termite treatment service for Perth, Western Australia. Offering superior Pest Control Services for Perth, Western Australia. Taking pest's seriously and doing this in an environmentally friendly way is our motto. We understand that in business you just have to have your pests under control at all times. For Restaurants, this is critical or be shut down. Understanding exactly what to do to keep your business up and running and in tip-top shape is our job. And, we happen to take that job very seriously. Give us a call. We work with all kinds of pests, from the types with fur to the flying and insects. We value our clients and work with under the Australian standards to keep your home and business pest free. Being a Reliable Pest Control Company we have acquired a lengthy list of happy customers, both residential and Commercial. We pride ourselves on offering the best service for the best price. Working with our clients to determine the best possible solution for their premises and implementing this. Our lists include factories, restaurants, homeowners, landlords and so many more great clients. Dedicated to our trade, we like to think we can get the best results in as little time as possible. Give us a call if you need Guaranteed Solutions for Pests or Termites in Perth!